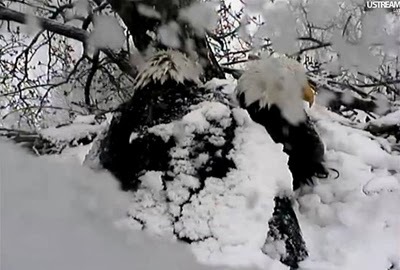 Does Bad Weather Affect Bald Eagle Egg Laying? Facebook fan Dianne Wisse asked the following question about the Decorah Eagles: "With the extreme winter weather predicted to continue and even worsen--more 'polar vortex' cold, snow and dangerous high winds--is there any chance it will affect Mom/Dad Decorah's chances of laying viable eggs, or might nature step in to prevent the loss of eggs/eaglets to the unusual weather?" 2013 was, like 2014, cold and snowy. 2012 was unusually warm, although the first half of 2011 was 'on the cool side', according to the Iowa Department of Agriculture. If weather impacted the timing of egg-laying, we would expect egg laying to happen a little later in cold,snowy years. But that's not what happens. Instead, Mom lays eggs a little earlier every year, regardless of the weather. I did a little reading about the regulation of bald eagle reproductive rates. In a study of bald eagles in southeast Alaska, researcher Andrew J. Hansen found that breeding activity is related to food abundance and habitat quality. He wrote: "Laying date was influenced by proximity to spring food supplies. Pairs nesting within 3 km of food patches laid eggs earlier than those nesting farther from food clumps." Hansen also found that laying date was advanced - that is, it happened sooner - where food was abundant. He believed that earlier laying was probably advantageous, since juveniles that fledge earlier have more time to acquire the skills required for surviving harsh weather and unpredictable food supplies. So cold and harsh weather don't influence egg-laying dates directly. But both can influence food availability, which does. During extremely cold and snowy winters, rodents might remain concealed under thick snow pack, fish and fish carcasses might be sealed under ice, and roadkill might be plowed under snow drifts, unavailable until the snow melts. In years where food is scarce, egg-laying happens later. If food can not be obtained, the nesting territory might be abandoned altogether. Fortunately, the Decorah eagles have an abundant and highly available food supply. It includes dead and live trout from the nearby hatchery, suckers and other fish from the creek, animals attracted to the 'food oasis', pigeons and other non-migrating birds that live in the area, and road kill. The eagles also have a lot of experience living here - they know their territory and its seasonal rhythms very well. The abundance and reliability of their food supply allows Mom to lay eggs a little earlier than she might otherwise. Experience might be the reason her laying date has crept up since we began keeping track in 2009. So in short, I don't expect her to lay egg #1 later significantly later than she has the past few years, although I'm not willing to predict a date. We've seen Mom gently footing and pecking Dad, and both eagles have increased their visits to the nest. Watch for copulation - that will help us estimate a time frame! In Alaska, egg-laying doesn't start until the beginning of April. Follow this link to learn more. The nesting chronology is on page 6. -13F in Decorah at 1:54pm on January 6, 2014. Yikes! We are getting a lot of questions about Mom, Dad, and cold weather. I've written about feathers and weather, but overwintering bald eagles also protect themselves by maximizing energy gain and minimizing energy loss. Every calorie is made to count. Bald eagles maximize energy gain during periods of cold stress by foraging in groups, gorging food, and assimilating more energy. As we know from watching Mom and Dad, some eagles remain on their territory year round. But many others leave their territory to roost communally during the winter, especially along stretches of open water. Communal roosters often forage in smaller groups of less than 20 eagles, increasing the likelihood they will find food with less energy expenditure than if they hunted alone. Bald eagles also steal prey from other eagles and birds (kleptoparasitism), an optimal behavior, at least during periods of food scarcity, for animals that forage together. When one bird finds food, all of them exploit it. This social behavior increases efficiency and decreases energy stress. Mom and Dad don't communally roost, and we don't know whether or not they forage with other eagles away from their home territory. The abundant, high-quality food provided by the trout hatchery, stream, and road may be an important enticement to stay on territory year-round. However, Mom and Dad are probably gorging the food they find. This helps them calorie load quickly, reduces the amount of time they need to spend looking for food, and helps prevent food stealing. The more quickly an eagle eats its food, the less likely it is something else will steal it! Finding food extracts an energy cost, so Mom and Dad need to make the food they find count! During periods of cold stress, bald eagles assimilate more food energy than they would otherwise. This may be because in extreme cold weather, blood flow is decreased to the skin and extremities and increased to the visceral organs, including the stomach. Greater blood volume in the alimentary tract might increase digestion of food, leading to greater assimilation of food energy when the eagles need it most. A similar mechanism has been found in snowy owls, who live and hunt in even colder weather. Bald eagles minimize energy loss by becoming sedentary, seeking protective microclimates, reducing night-time body temperature, and reducing foraging costs. 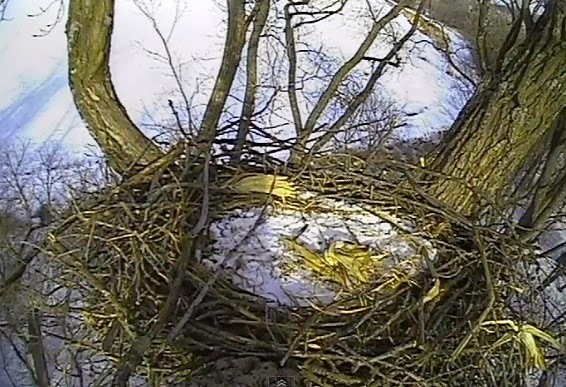 This time of the year, we don't see Mom and Dad at the nest as often during periods of extreme cold. Flying, stick procurement, and nestorating all have a high energy cost, and overwintering eagles need to minimize energy loss. So what are Mom and Dad doing right now? Probably nothing at all. In extreme cold, minimizing activity maximizes fitness. When overwintering eagles do fly, they don't tend to make long trips. They also seek protective microclimates. Needled conifers hold more heat than leafless deciduous trees, so Mom and Dad might seek shelter in a pine grove. There may also be some sun-warmed, wind-protected pockets next to the bluff, or some protected space between the trout hatchery buildings and the bluff. These areas will reduce wind exposure and hold heat more efficiently, which helps the eagles minimize energy loss. Like mammals, birds are endotherms - that is, they maintain an internal body temperature. Maintaining body temperature takes energy, so anything that helps an eagle maintain its temperature reduces energy loss. Although eagles are endotherms, they don't have to maintain a given body temperature all of the time. Bald eagles reduce their body temperatures at night an average of 1.8 degrees. This slight hypothermic condition reduces the temperature gradient between their body and the environment, letting them burn fewer calories to stay warm. Mark Stahlmaster estimates that this saves about 4.6% of an eagle's daily energy budget - a very big deal during periods of cold stress. Once again, we see Mom and Dad doing more by doing less.